According to MSBA, the role of the school board is to determine the direction and vision of their children's education. Does any school board member out there feel they have control over the direction of the education produced in their district? Do any boards feel they have control of the overall vision of education that they are providing to their children? If any school board member has answered yes to either of these questions then they have succumbed to the grand illusion of modern school board. The MSBA website provides a history of school boards in our state. The Act of 1820, which allowed Missouri to become a state, established the township as the first way of organizing schools. This system led to the creation of many small, autonomous schools governed by local citizens. Then, in 1839, the Geyer Act was passed. This Act is generally recognized as the real beginning of organized education in Missouri. It eliminated the township system and created what were known as sub-districts governed by three trustees. Another sweeping revision of Missouri’s education laws in 1874, gave almost complete control of schools over to local citizens. Among other things, citizens were empowered to elect local school district directors. By 1878, there were about 10,000 separate school districts in Missouri. No more than 100 of them offered courses above the elementary level. These thousands of school districts brought education within reach of nearly all the population and led to the pattern of school district development in the 20th century. From there it describes history where a group of school board members first got together informally in 1936 to exchange ideas. The general intolerance for informality (because it does not provide clear power distinctions) caused the group to change. They created a more formal structure instituting officers, dues and eventually lobbying (initially lobbying was prohibited.) The focus of MSBA shifted from being a place where districts could learn from each other through the exchange of ideas and information to "monitoring legislation." In the early part of the last century schools had already seen laws that: extended the school year beyond three months, required teacher training and certification, consolidated school districts and imposed mandatory attendance. By the middle of the last century we had already moved a good deal away from the community setting the vision for education. The MSBA has had a hand in transforming the role of the school board. MSBA instituted training for school board members which is its only other main focus to this day besides monitoring legislation. They note that the "Missouri Outstanding School's Act requires all school board members to receive 16 hours of training, within their first 12 months of service. MSBA’s Certified Board Member (CBM) program offers Essential Board Member Certification, which fulfills this requirement and provides the foundation for becoming an effective board member." MOSA was passed in 1993 under Governor Mel Carnahan and focused on several key areas: Show-Me Standards, Missouri’s Curriculum Framework, Statewide Assessment, Professional Development Standards, Professional Standards for New Educators, Technology Grants, and the Missouri School Improvement Program. It also seemed to recognize that school boards were not functioning "properly" and members therefore required special training. The fact that MSBA had established training years before is probably just a coincidence and the fact that their training covered everything in MOSA simply an after-the-fact design. It certainly seems to be counter to the statement on their website that citizens from all walks of life could participate in the development of an education vision on their local school board. They may come from all walks, but they need extensive training to be able to do what their predecessors got together informally to do for decades. This training that school board members are now, by law, required to receive (although note that the law does not specify that MSBA must be the provider), contains useful information like how to analyze a budget, what do Sunshine Laws cover, and Roberts Rules of Order. They focus on keeping the meetings civil. While MSBA cannot take credit for the 3 minute rule for public commenters (that we got from the Home Owners Associations), they have helped push this method for controlling the unruly public, which is exactly what the HOAs invented it for. Virtually every school board has instituted the three minute limit for public comment. If you limit the paying members of your HOA to three minutes to comment or complain about what you are planning to do, it certainly does make your meeting run more smoothly. It also makes it infinitely easier for HOA's to pass the rules their boards want. As a model for a quasi governmental entity it is great. However, a study of 3,000 people found that two thirds of them thought their HOA's were "annoying" or worse, 19% had been "at war" with their HOA and 54% would rather live in a sloppy neighborhood than deal with an HOA. The three minute rule does not seem to have a positive impact on your public image. It is an attempt to apply Disney-esque techniques to what is naturally a messy process. Placing videos and exhibits along a ride's waiting line distracts the public from the monotony of waiting for long periods of time. Placing a turn or new segment to the line breaks it up and makes it harder for people to take in the big picture of their long wait. They become compliant cattle, grateful for any time the people in front of them move forward. 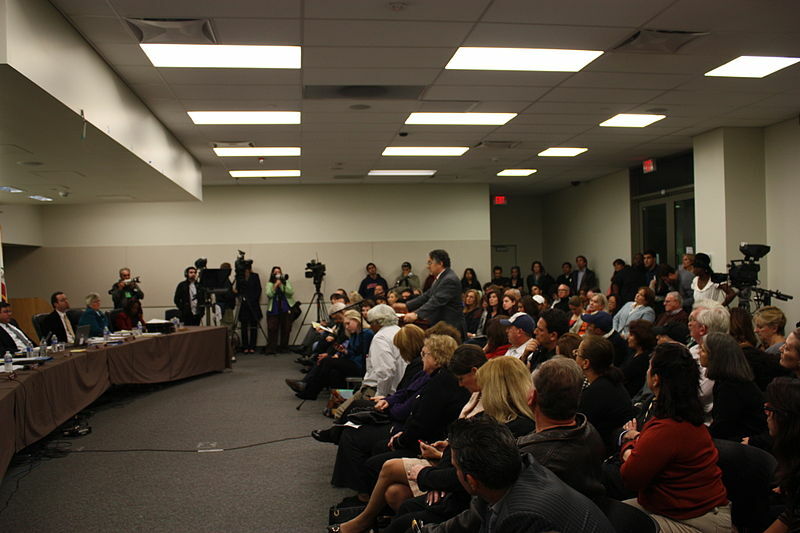 Allowing many people from the public to come up and speak to a school board for three minutes, gives the impression of providing input, but is far from an open dialogue. It is hard to see the big picture of their concern or how you are going to address it. Governing in a representative democratic process is challenging and far from neat, but there is a growing percentage of the public who feels that the tight regulation of the process makes it almost impossible for their opinions or thoughts to be heard. The "open exchange of ideas" is quickly becoming a part of nostalgia, like the initial meetings of the MSBA. The Delphi Technique is becoming more widely employed. One school district, without naming it so, has proposed officially adopting the delphi technique as their "communication protocol." Sunshine Laws, instead of working to keep the process transparent, restrict the players to only formal structured (read limited) communication about issues, never gathering in numbers that could be considered quorum and stifling private conversation with the public of items on an official agenda. In terms of these representatives from all walks of life being able to determine the "direction and vision" for education, that ship sailed long ago. The Business Rountable, The Gates Foundation, the Council of Chief State School Officers and the National Governors Association have set that vision for the school districts since the 80's. The only decisions being left to the school boards are the minor ones, that the real power brokers don't think they can screw up too badly. In our state the Governor almost single handedly sets the vision. He signed us on to Common Core in 2009 before a single standard had been written. That required true Kreskin-like vision. He then required his appointed state board of education to approve an Education Commissioner nominee who would go along with his vision. The SBE, following the governor's vision, not one they had developed, directed DESE to implement that vision. DESE in turn directed the district Superintendents to implement that vision. School Boards were told by their Superintendent that they would be implementing Common Core. School districts who have pushed back against Common Core have been threatened (despite prohibitions in state statute for doing so) with the loss of their accreditation if they pull out of Common Core. The districts are promised that they can set the curriculum, but actual school board members are advised to leave those decisions to "the experts," the administrators and curriculum directors. Those experts will, in turn be forced into picking curriculum that aligns with the standardized tests they didn't choose, thus placing the control of the direction of education in the hands of the Smarter Balanced Assessment Consortia (Pearson). 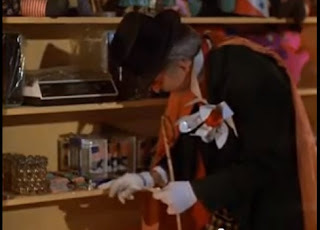 I can't help but recall a famous scene from "The Jerk" where Steve Martin's character tells people at his carnival game booth which prizes they could win, limiting their choices ultimately to a small three inch space on the shelves. Though state statute requires DESE to get budgetary approval from the legislature each year for what they plan to do with the money collected from districts and taxpayers, the Governor maintains line item veto over that budget giving him the ultimate authority for all educational decisions in the state. Certainly doesn't sound like local school boards "offer citizens from all walks of life the opportunity to determine the community’s direction and vision for their children’s education." Later this week we will hear from school board members about what their experience has been like serving on a school board. I don't think it will much match what MSBA has said it should be. "In the early part of the last century schools had already seen laws that: extended the school year beyond three months, required teacher training and certification, consolidated school districts and imposed mandatory attendance." "Governing in a representative democratic process is challenging and far from neat, but there is a growing percentage of the public who feels that the tight regulation of the process makes it almost impossible for their opinions or thoughts to be heard. The "open exchange of ideas" is quickly becoming a part of nostalgia, like the initial meetings of the MSBA. The Delphi Technique is becoming more widely employed"
, are closely related. The problems we face today,nationally, first to root in the local schools, and they won't be resolved until they are rooted out of them.